Our first stop as we explored County Kilkenny was Jerpoint Abbey. Located near Thomastown, just south of Kilkenny, you really can’t miss it as it nestles up to a curve of the N9 (a major roadway). We received a great lesson on the history of Jerpoint Abbey from Sheila in the interpretive center- be sure to stop in, you will learn so much and notice things you may have overlooked as you wander through the abbey. Note: Jerpoint Abbey is an OPW Heritage Site. Admission is included with your Heritage Card. If this is your first stop you can purchase a card here for use at other OPW sites. Jerpoint Abbey was founded about 1160, probably by the King of Ossory, and in 1180 it was colonized by Cistercian monks who followed the austere life of prayer and hard work. Sheila told us that there was so much work the abbey required two sets of monks- the lay brothers who did 90% of the work and 10% of prayer and the monks who did 90% of the prayer and 10% of the work. In the cloister, where the monks would have slept, you’ll find incredible carvings and artwork adorning ornate rounded arches. Most Cistercian abbeys do not have this type of artwork which suggests the monks at Jerpoint may have been a bit removed from the original rigor of the Order. This one of a knight is especially easy to see; some are quite worn with age and time. What you may have a difficult time seeing is that little indentation to his left. Medieval abbeys are amazingly beautiful even in their ruined state. It is impossible to imagine people with no modern tools and machinery building such magnificent structures that have lasted hundreds of years. The nave and the north aisle are incredible to stand in. You feel very small as you walk through the arches and marvel and the skill that went in to creating a structure like this. Of course the girls just thought it was fun to play in the “tunnel”. It is thought that the stone carvings were once painted. The image would certainly be easier to decipher! Every time I look at it I see something different. Today I see a happy monk with a walking stick in his right hand who appears to be carrying wood-on which a cat is perched- in his left hand. What do you see? Could this be St. Nicholas? There has been much speculation about who the bishop in this carving is. Some say it could be St. Patrick, Ireland’s patron saint. 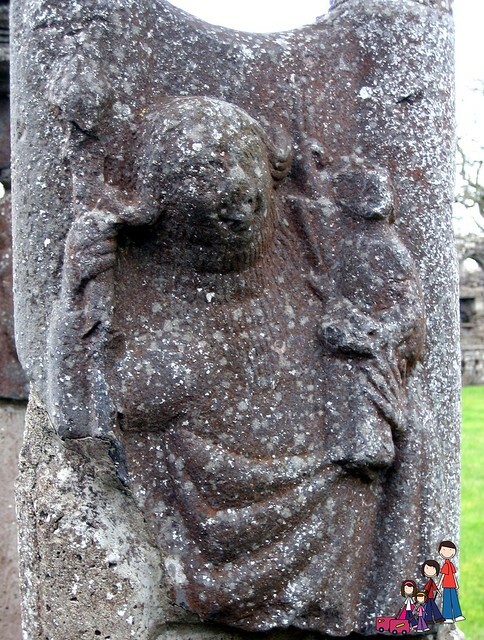 I like to think that it is a carving of St. Nicholas, who is said to be buried near by. According to local legend the church of St. Nicholas, which was located just west of the abbey, is said to be the final resting place of St. Nicholas. St. Nicholas, the bishop of Lycia, was known for leaving anonymous gifts for the poor; his generosity led to sainthood soon after his death. 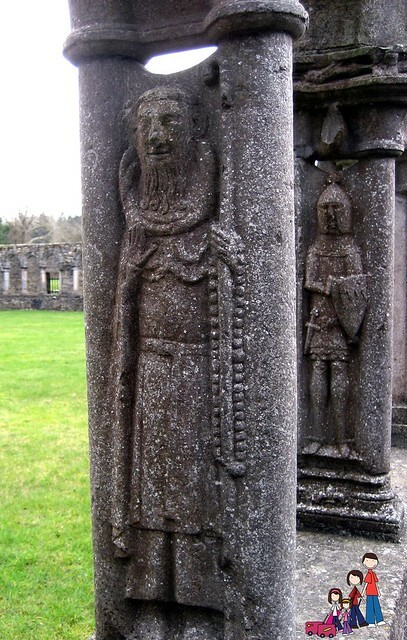 Though the saint was initially buried in Myra, in modern day Turkey, Irish historians claim that his remains were twice moved by Crusaders and came to rest near Jerpoint Abbey 800 years ago. The ruined church of St. Nicholas can be visited with your tour of Jerpoint Park and the lost village of Newtown Jerpoint. 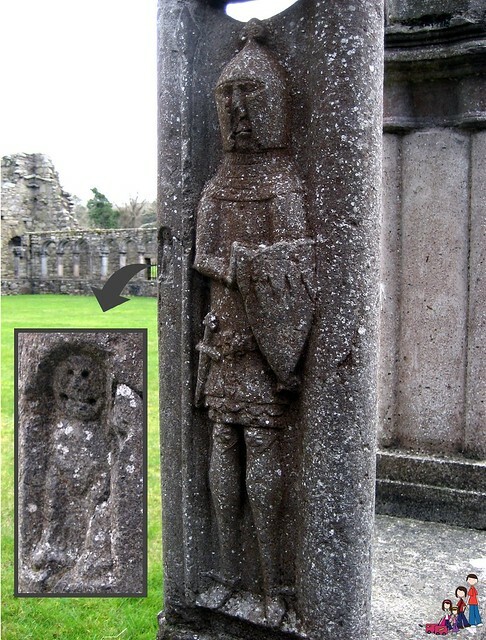 It contains an unusual grave slab with a carving of a bishop, said to be St. Nicholas, and two other heads which are said to be the Crusaders who brought his remains to Ireland rather than let Christian relics fall into the hands of the Saracens.